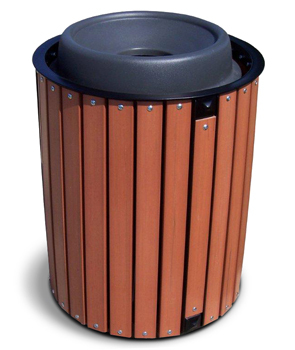 These Township trash receptacles can be constructed with your choice of White Oak, Recycled Plastic or Aluminum slats. Slats have 3/8" spacing between each piece. The frame of these Township trash receptacles can be finished in any of the color options as shown. 32 gallon liner is included with a black flat top funnel lid. Dome top lid featuring a push-open/self-closing hinged door is available. 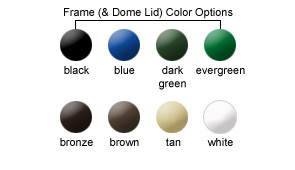 Dome Top lid is powder-coated in the color option of your choice. Color options are as shown. Aluminum: Comes standard in white, with small ribbing on each slat for added texture. Aluminum slats are rust resistant and well suited for outdoor use and longevity. White Oak: Ranging in color from beige to dark tan, White Oak is decay resistant and great for outdoor use. Its fine texture bends well and is often used for boats, fences or floor boards. Recycled Plastic: Made from post-consumer materials, Recycled Plastic slats come standard in a dark, reddish brown color. Popular choice because of fade and chip resistant properties.